I might have overwhelmed Ali at the new Yemeni store in my neighborhood because I had specific instructions on how I wanted the lamb shank I was buying cut. He’s used to roasting the entire leg of lamb, not slicing it in large pieces. I told him I was making a tagine with dates, and he finally understood that an entire leg of lamb won’t fit in my pot. He then started rapping with me about North African food and his English-Yemeni roots, and I now have a new friend who will give me a call when fresh oxtails come in in his store. 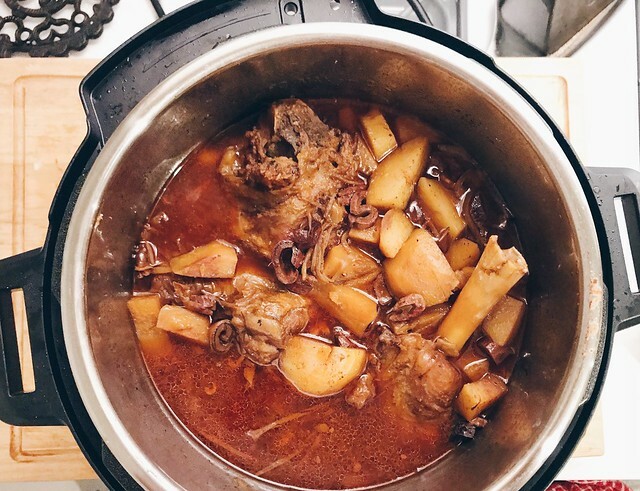 It is important you trim off the excess fat from the lamb shanks before you try this recipe. With the butter and the cooking in high pressure, my lamb was swimming in fat when it was done. Not that there’s anything wrong with that, of course, but your guests may be turned off if there’s too much of the good stuff. When you serve the leftovers the next day–yes, there will be leftovers–you can skim the coagulated fat from the top of the sauce before you heat it up. I loved the red potatoes here because they lent the dish a hearty solid. 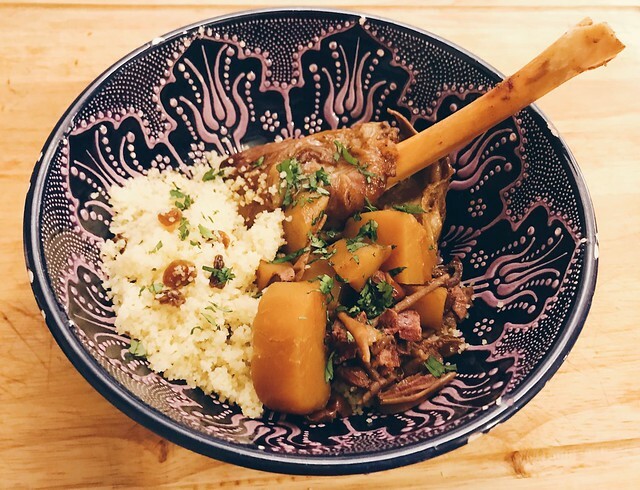 While the lamb meat was falling off the bone, the large potato chunks were perfectly tender to smash into the couscous with a fork. Cook your couscous with golden raisins and the sweetness will be a nice addition to the buttery lamb. 1. Season lamb shanks generously with salt and pepper. 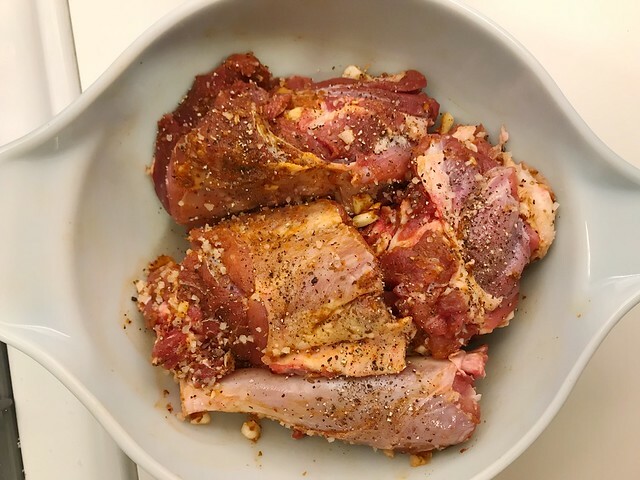 In a small bowl, combine garlic, fresh ginger, paprika and cumin, and rub all over shanks. Leave shanks at room temperature to season for at least an hour. 2. Using the sauté function of your Instant Pot, melt butter. Add onion, saffron, and sprinkle with salt. Cook for 5 minutes, until onions are soft. Stir in tomato paste and cook 1 minute. Add seasoned shanks and let cook with onions, turning occasionally, until meat and onions are lightly browned, about 10 minutes. 3. Add potatoes, cinnamon stick, ginger powder, chopped dates and water to barely cover to the pot. Cover and lock the lid properly. Select the Pressure Cook function for 30 minutes. When it’s done, do a quick release after venting and letting the steam out. Stir in parsley and serve with couscous. I have the Instant Pot DUO60 6 Quart, but this is a similar model, just pricier!